Simple, screw the Tripod Mount onto your tripod, then attach your GoPro Hero Camera on to the Mount. Simple as that. Use your existing GoPro Thumb Screw to secure the camera housing to the Mount. 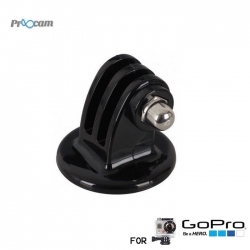 - Compatible with all GoPro cameras except the Digital HERO 4 Wrist Camera. - Quick-release tripod mount moves conveniently between shots and locations. - Tripod mount enables GoPro camera to be attached to any standard tripod easily. - Compatible with all GoPro cameras: hero 4 session, hero+ LCD, hero 4, hero 3+, hero 3, hero 2, hero.